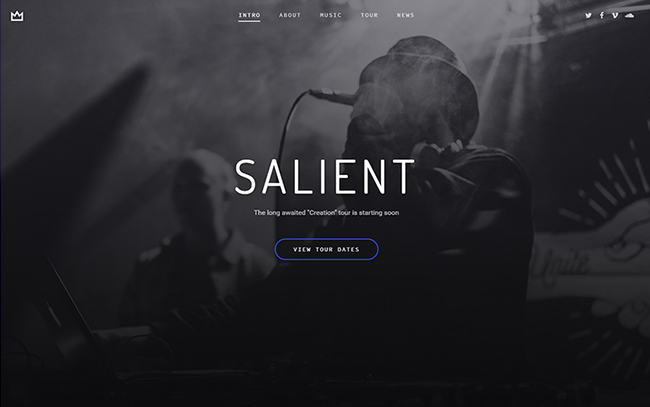 New demos are continually added and buying a single license for Salient gives you access to all of what's shown below, plus everything that will be added in the future. 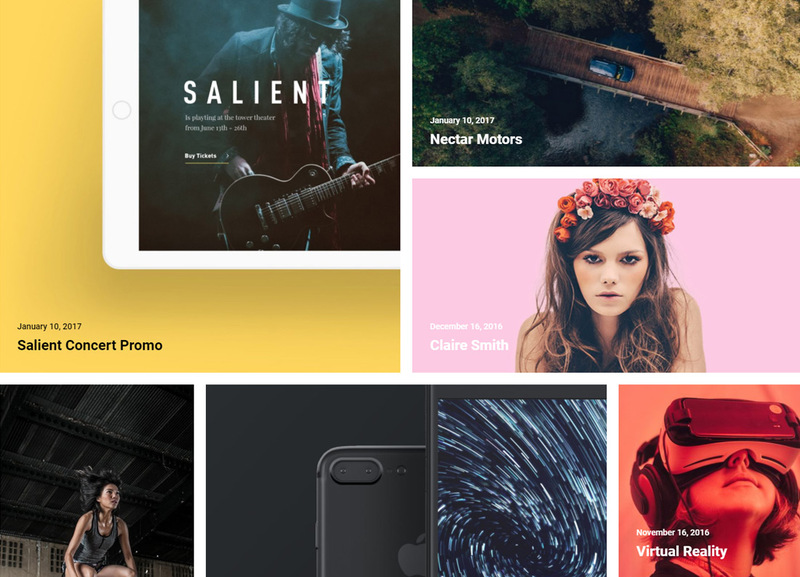 Give your users a better experience with the new product quick view, new shop layouts and stunning interactive elements. Immerse your customers with a stunning interactive shop design. 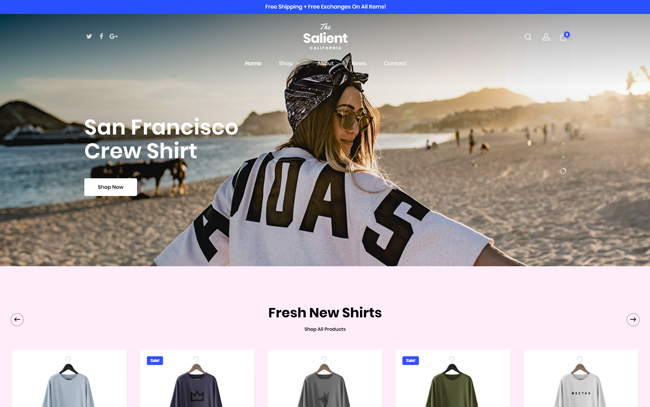 This demo highlights the new category grid page builder element and refined WooCommerce integration. Elegant and gracefully sharp. 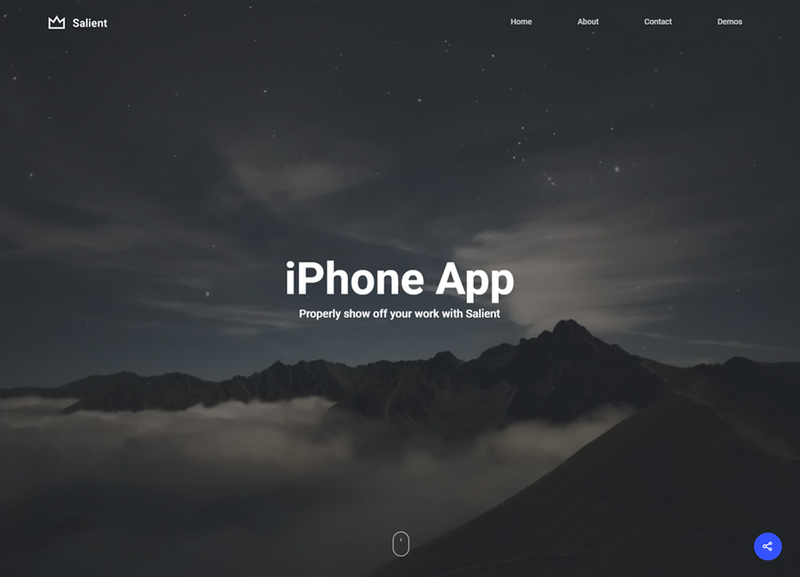 Show off your posts beautifully with this dark concept. 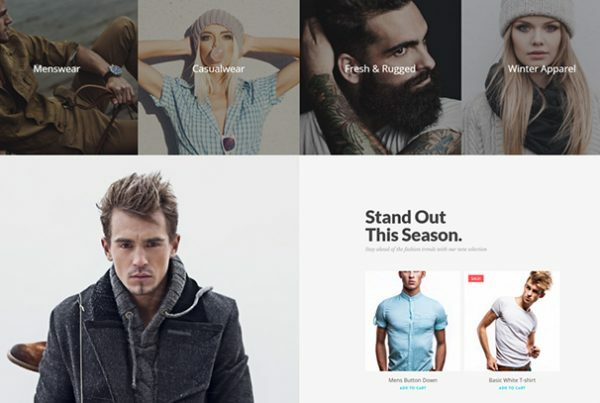 This demo makes use of the new auto masonry post grid for effortless sophistication. A business oriented setup that's pure eye candy. 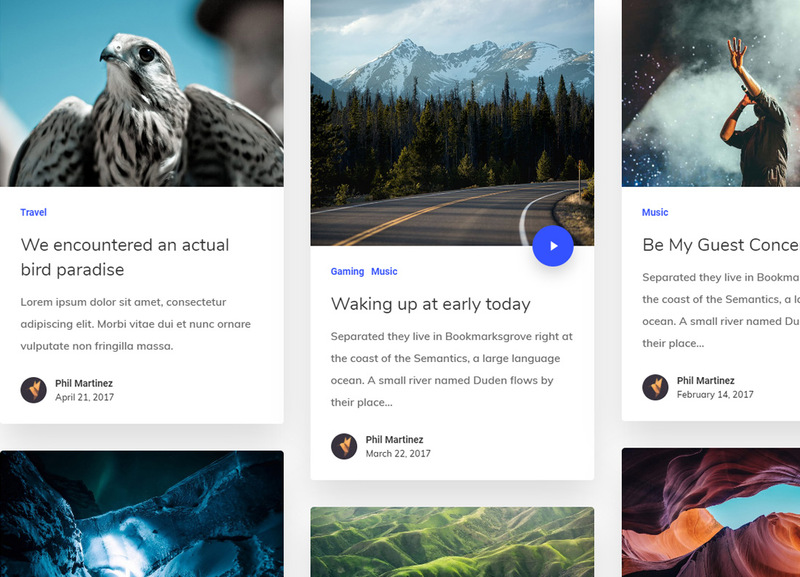 This material inspired design showcases fresh features that are sure to draw and hold the attention of your user from their first glance. 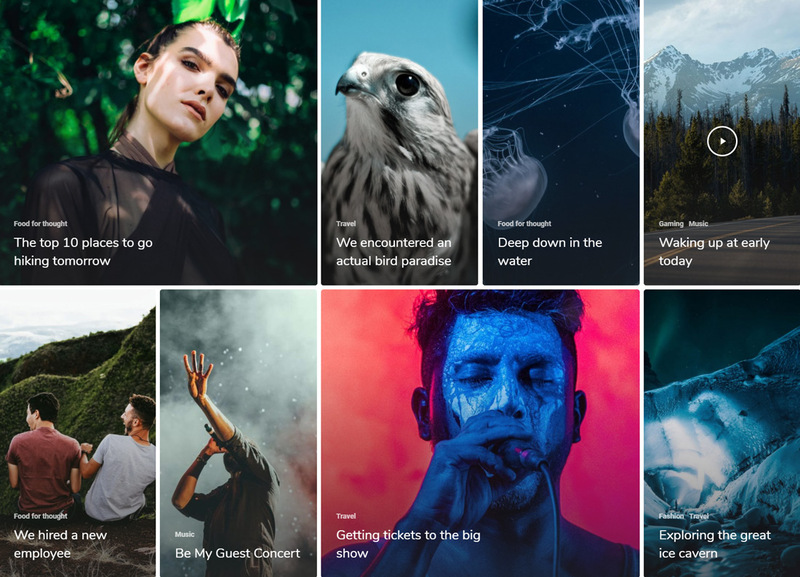 Combines different blog styles and elements to create a seriously awesome blog landing that's anything but ordinary. 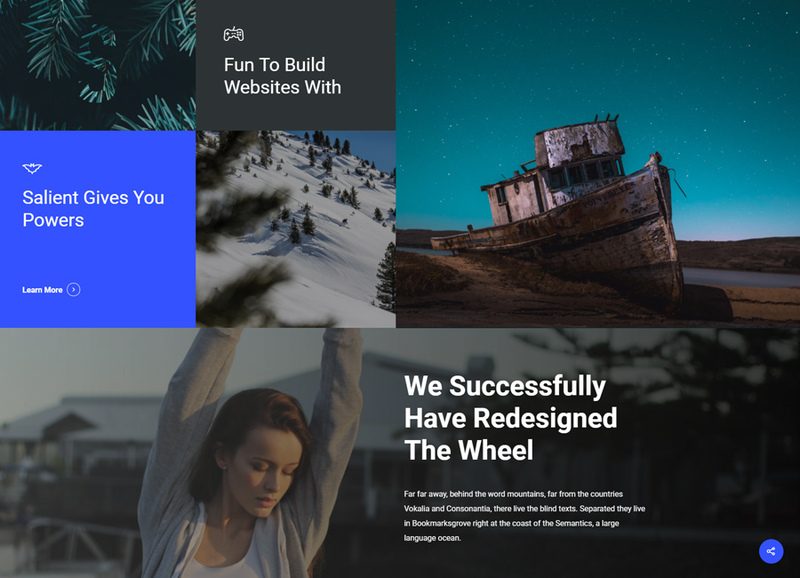 Tons of gradient coloring, SVG shape dividers & parallax boxes makes this demo fun for all users. See for yourself how Salient is different than the rest. 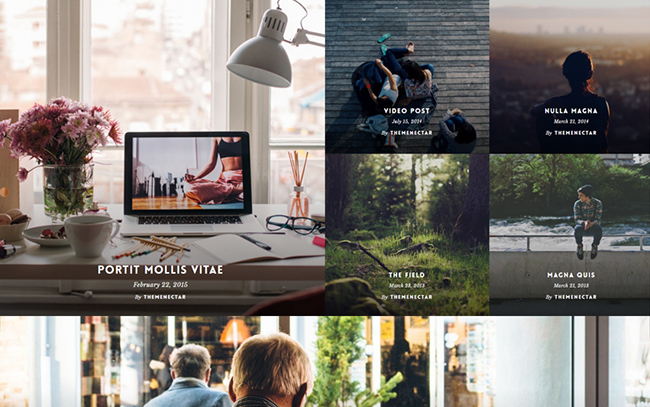 Magazine style layouts can be easily achieved thanks to the robust power added to the blog elements in v8.5. 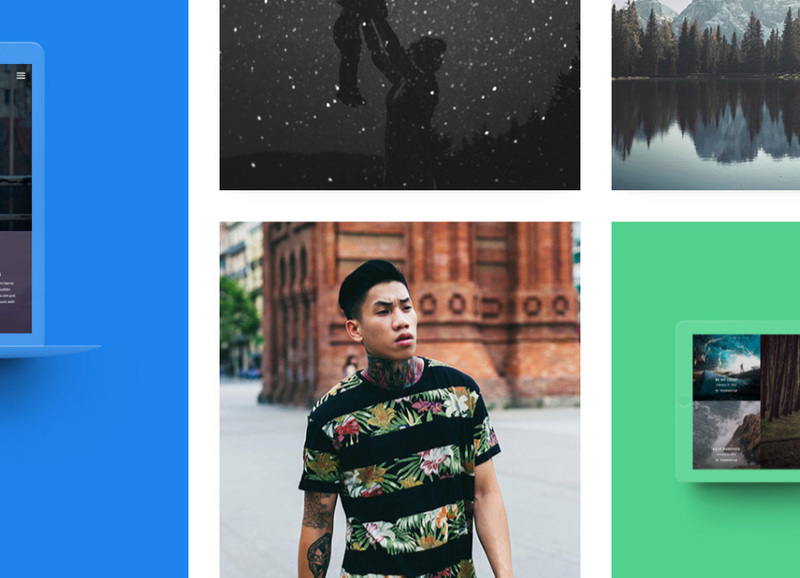 Sticky sidebars, trending posts & post sliders are some of features highlighted. 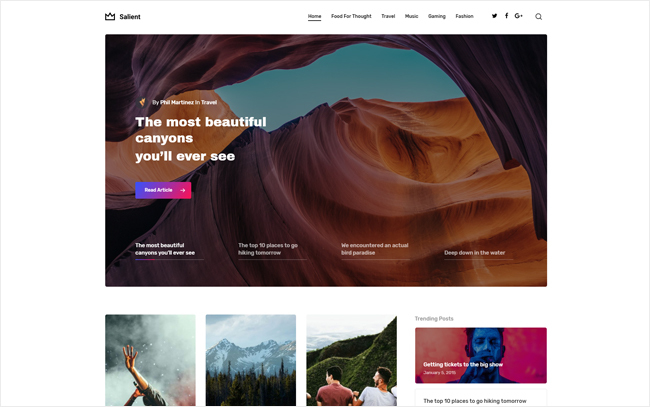 Overlapping elements, new material based off canvas navigation and fancy animations create a sleek design & intuitive user experience. 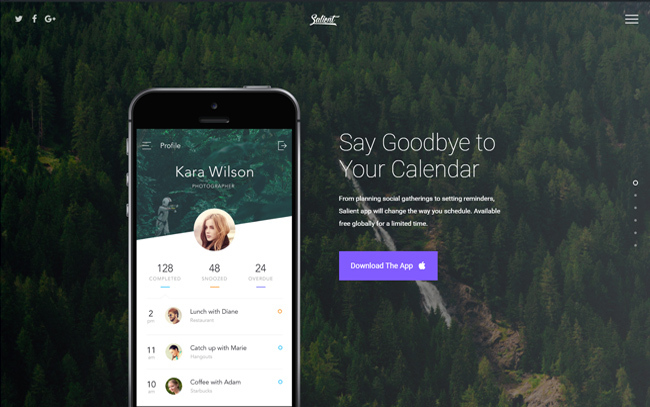 Salient Startup combines minimalism with modern material design. 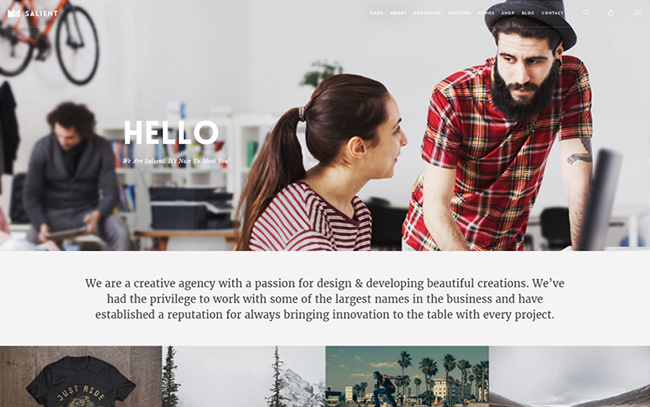 Useful for nearly any application, this template will surely elevate your brand in a meaningful way. 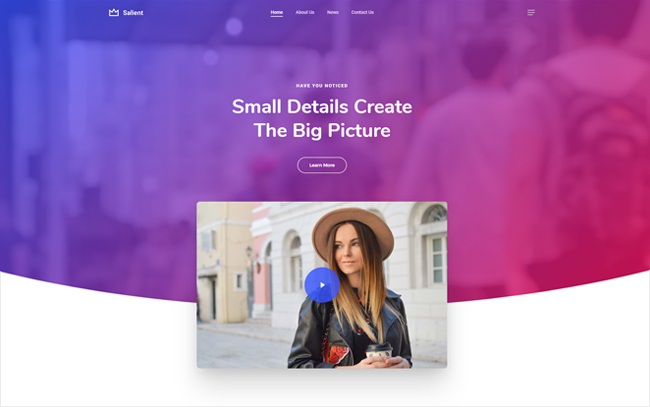 Wow your audience with our full screen parallax projects slider. Silky smooth animations, even on mobile devices. 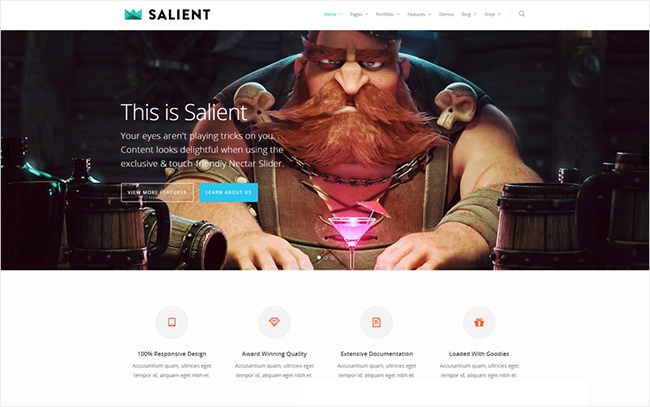 Witness the awesome power & flexibility of Salient through the example project case studies created. A multipurpose restaurant demo with just enough flare to entice but not overwhelm. All the necessities are taken care of including a full food menu, story section, gallery & more. 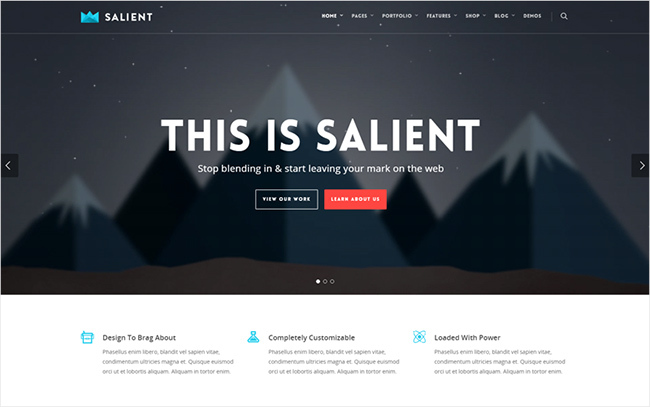 New in Salient 8.0. 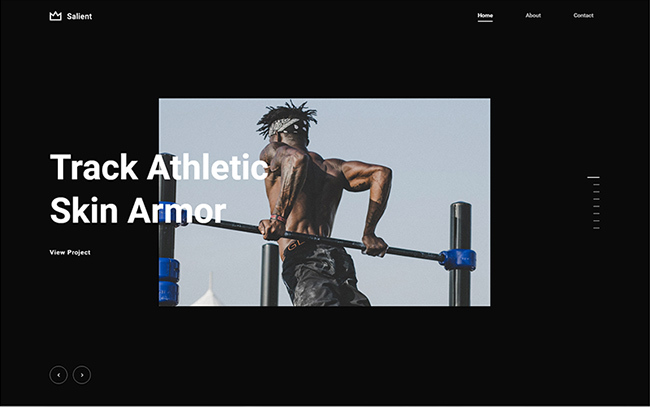 An ultra clean layout appropriate for any business looking for a polished online presence. 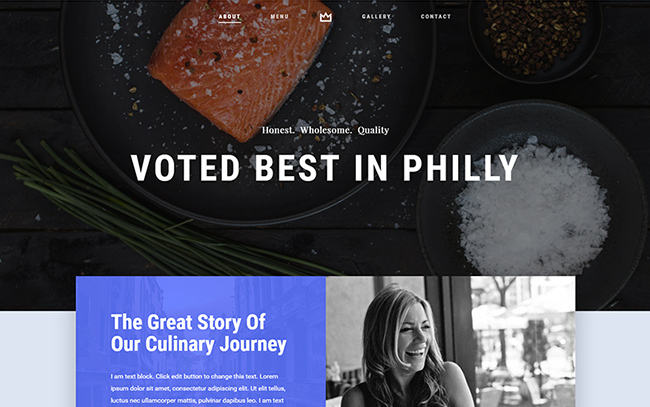 A fixed left menu provides prominent & easy navigation always available for your users. 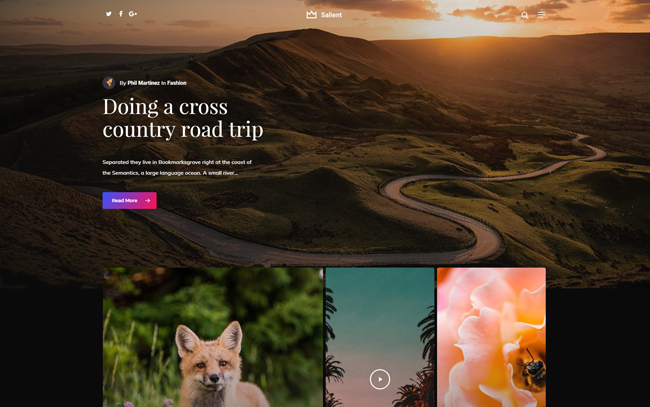 A Nectar Page Full Screen Row demo. 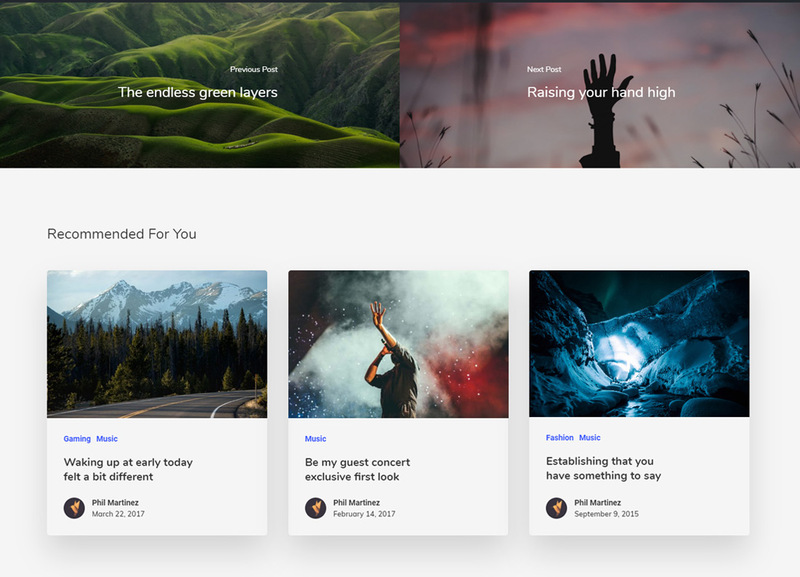 Salient Service shows off how you can transform normal section blocks into an immersive single page story. This demo also makes use of the option to disable the effect for a regular website display on mobile devices. Another use case of the Nectar Page Full Screen Row option. The perfect way to show off a new product to the world in a memorable way. This demo also shows the full screen row effect left enabled on mobile devices. The third example of using Nectar Page Full Screen Rows for an eye catching colorful presentation of a mobile app. 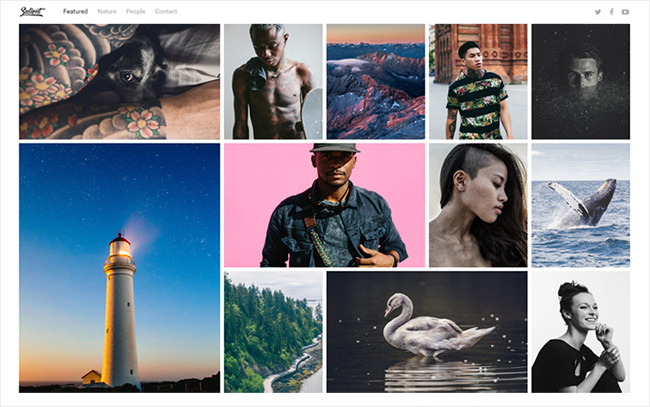 A minimal image gallery perfect for photography portfolios. 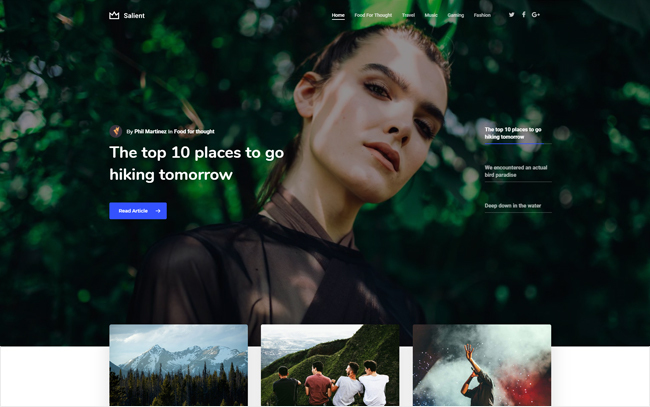 The full width grid layout with passepartout body border makes this the ideal template for photographers who want their work to shine. This template makes use some of more flashy features Salient has to offer. 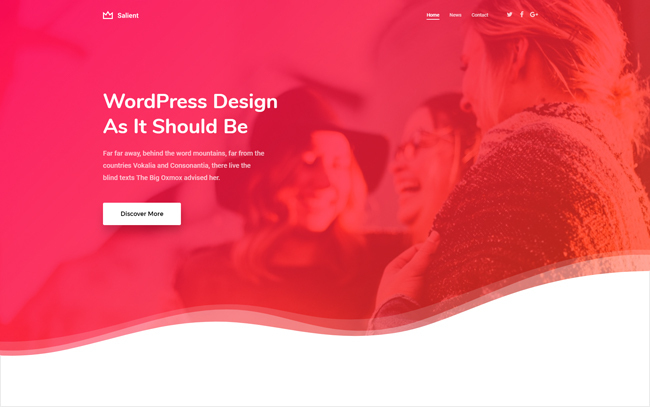 A 3D page header, bold design elements and a permanent transparent header navigation. Perfect for creative agencies that are looking for something different. 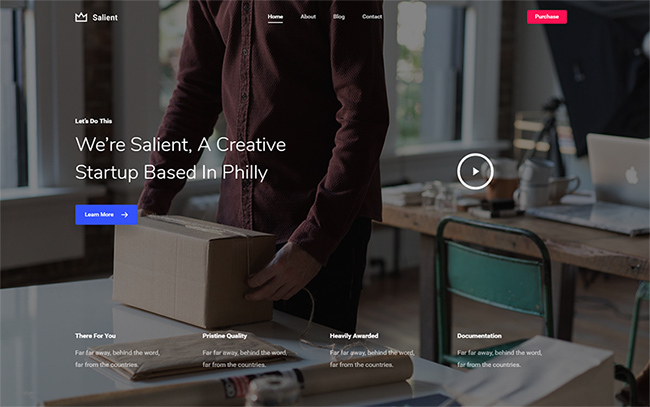 A multipurpose business template with strong typography. 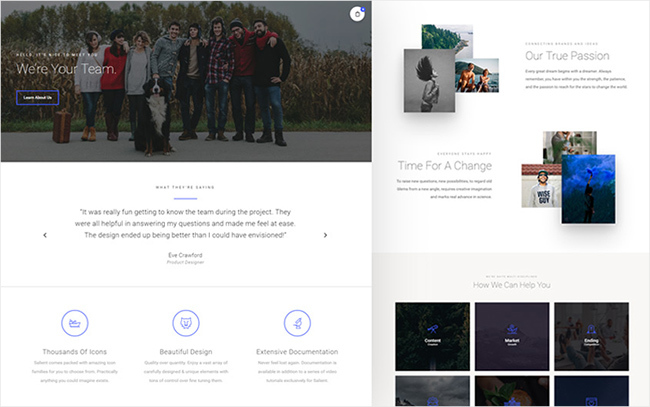 This demo covers all the fundamentals including full portfolio, blog and tons of content layouts. 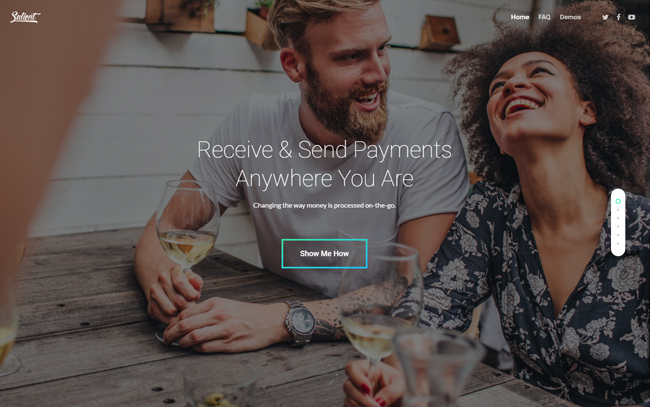 An eCommerce focused demo powered by WooCommerce. Start selling products online today easily to boost your business to the next level. A blog oriented demo showing off the "meta overlaid" masonry style. 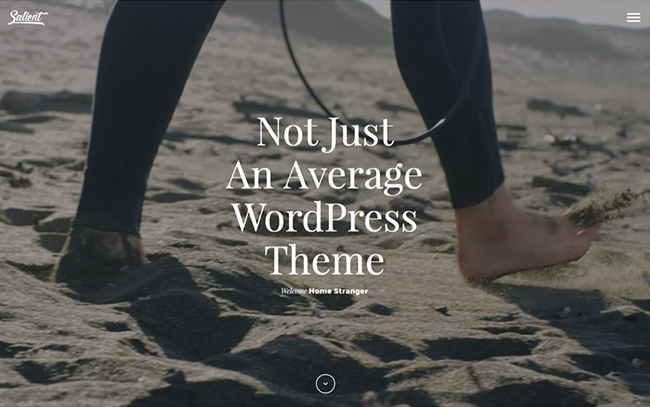 Suitable for a wide array of blog types from its simple, yet elegant design. 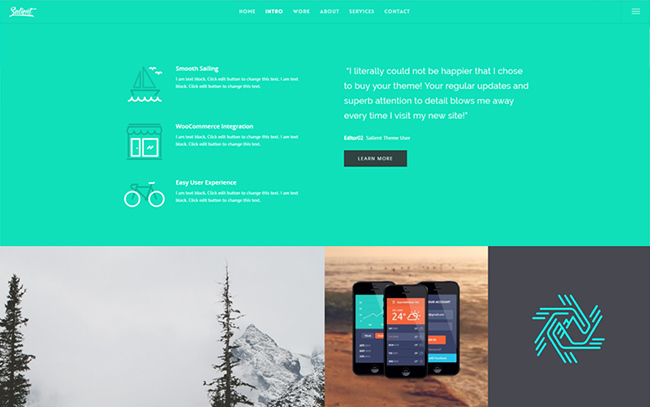 A classic Salient template created to show off its variety of clean design features. 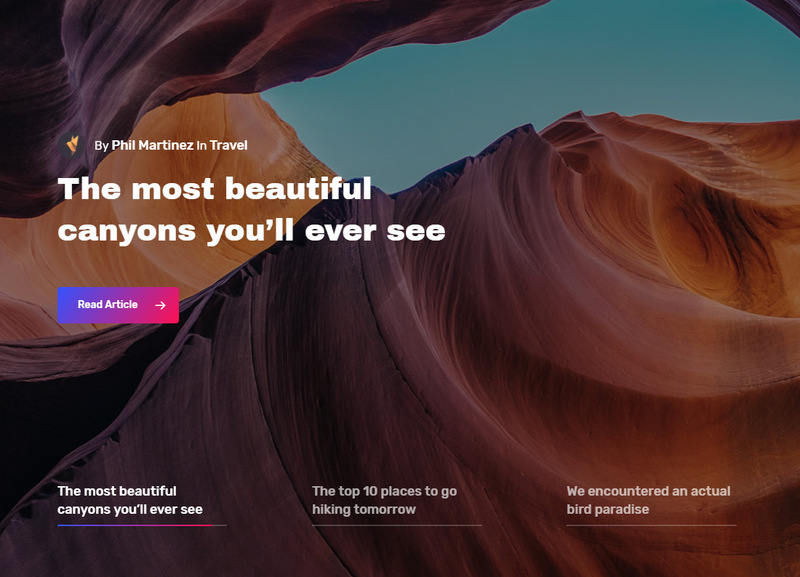 A video background is highlighted in the Nectar Slider for a attention grabbing entrance. A one page demonstration of how you can have links in your navigation lead to sections on your page. This demo also shows off the option to have your header inherit the row of the section it passes. The old school multi-purpose Salient demo. 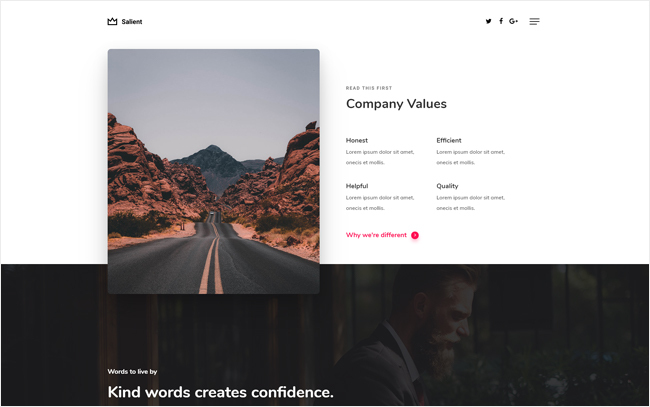 A simple business design that's to the point without too much animation. 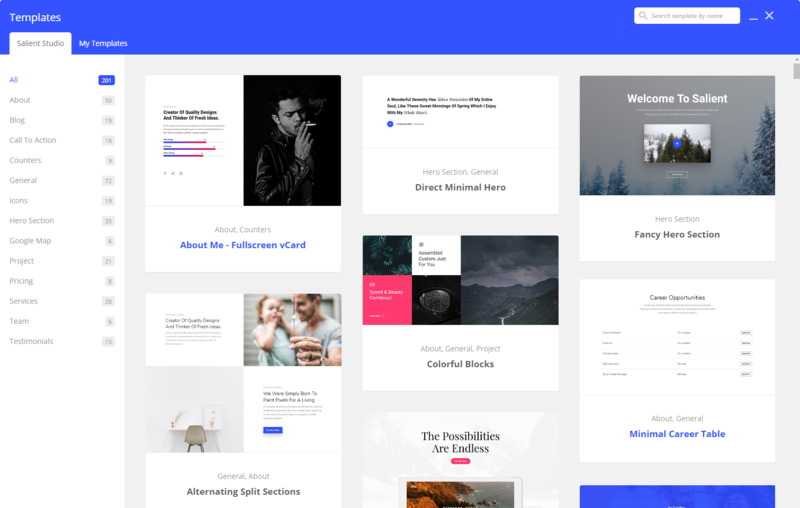 Mix and match from over 250 Salient exclusive section templates on the fly, all directly in our page builder. The templates are all fully customizable and available in one click, no importing required. 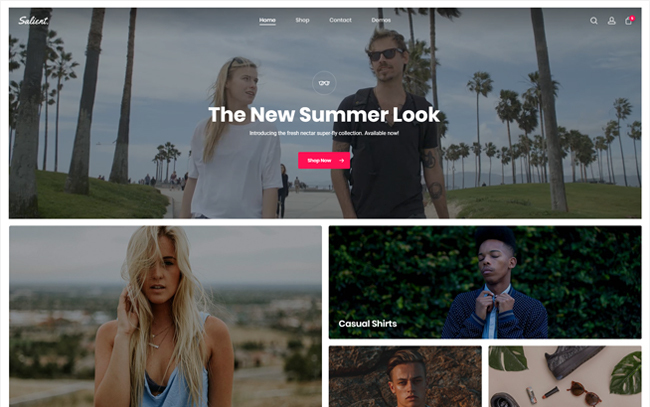 Create something unique & beautifully tailored to your needs In only a couple minutes. 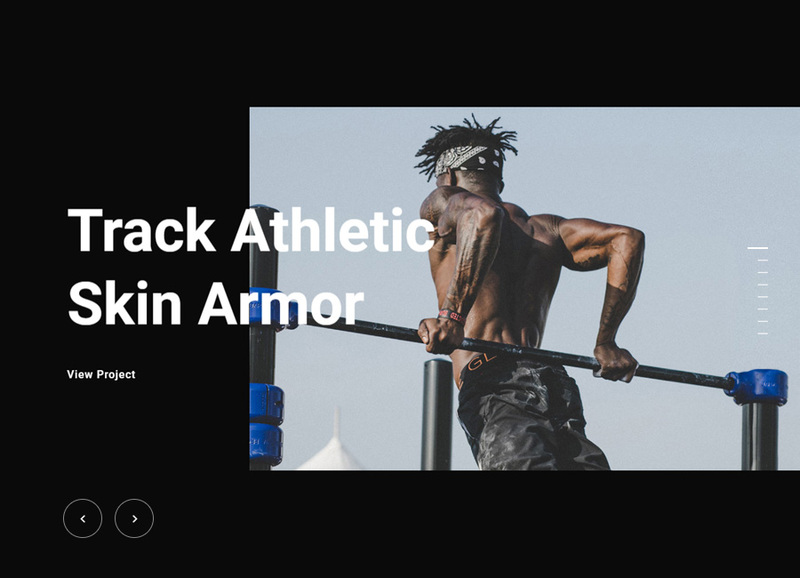 Fully capable of creating everything from personal blogs to complex magazines. 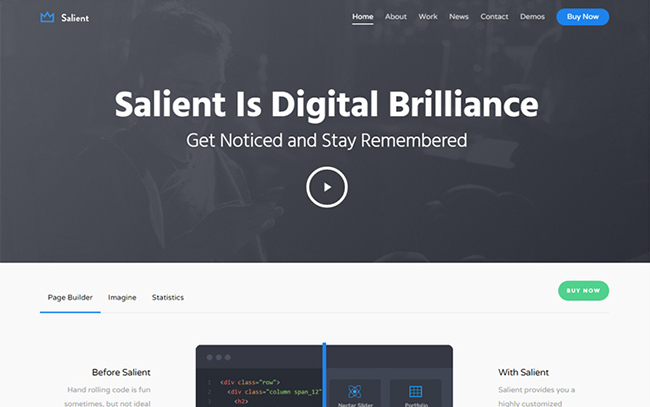 Salient blows away the competition featuring 8 core blog styles, 11 recent post styles and tons of options to customize each. 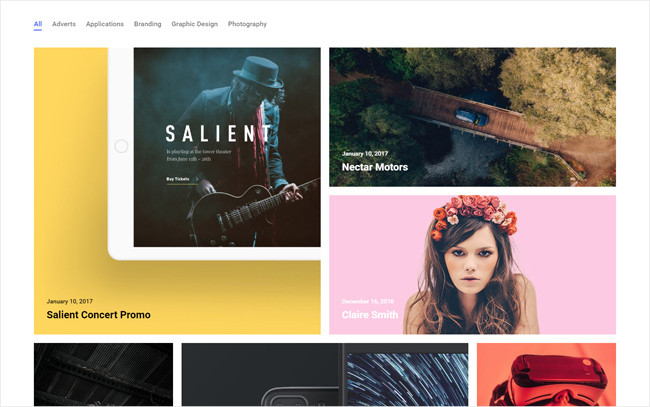 9 Portfolio styles to choose from which can be displayed in various grids of your choosing. Show off your work in style and attract more attention where you deserve it.